The North and the circumpolar regions, above 60º latitude, are considered to be one of the less populated areas of the world. This map shows the last numbers on that, distributed by country and organized by percentatge. This is published in Arctic Pollution Issues. A State of the Arctic Environment Report. Stefansson Arctic Institute, 2004. Arctic Human Development Report, and the map was created by Hugo Ahlenius, UNEP/GRID-Arendal. Like the Chavchu group of the Chukchi and the Koryak, the Aliutor people were mostly nomadic reindeer-breeders which is exactly what their self-designation, ramkyken, means. The earliest reports of settled off-shore Aliutors date from the end of the 17th century. They called themselves elutel’u. S. Krasheninnikov, who explored Kamchatka in 1755, considered the Aliutors to be a separate ethnic group. Various documents from the 18th century also give separate mention to the Koryaks, Aliutors and Chukchis. In the 1930s the Aliutors were confused with the Koryaks, and both were called nymylan. The name Aliutors, reinstated later, obviously comes from the previous designation of the settled tribes. Hence also, the name of the Oliutor district. The Aliutors live on the Kamchatka Isthmus in northeast Siberia. Their territory encompasses nearly 15,000 sq. km. stretching from the Karaga Bay of the Bering Sea to Oliutorka (formerly Alutorskoye), and from Rekinniki to Podkagernaya on the coast of the Okhotsk Sea. Administratively, they belong to the Koryak Autonomous District, Kamchatka Region, Russian Federation. From 1930 to 1977 the territory had the status of a National District. Beside the Oliutor District, Aliutors live in the southern part of the Karaga district and the northern part of the Tigil district. The administrative centre is Tilichik (Tyliran) in the Oliutor district. Most of the territory belongs to the zone of woodland tundra. The climate is influenced by both the Bering and the Okhotsk Seas. No official data on the Aliutor population is available. A report of 1934 mentions them as a sizable ethnic group after the Chavchus. Nowadays, the Oliutor district, like the Koryak Autonomous District displays enormous ethnic variety. In all probability official statistics still do not distinguish the Aliutors from the Koryaks. Their actual number is possibly 2,000 to 3,000. Anthropologically the Aliutor people, like the Chukchi and the Koryak belong to the mongoloid Northern-Asiatic race. They are characterized by a swarthy complexion, dark eyes and straight hair, a short and stocky figure, a very broad flat face and a conspicuous Mongolian fold. There is little facial hair. The Aliutor language is a member of the Chukchi-Kamchatka group of the Paleo-Asiatic or Paleo-Siberian languages. Genetically, it is connected to the Chukchi, Koryak, Kerek and Itelmen languages. In the 1930s Aliutor was still unanimously considered one of the four southern dialects of the Koryak language, but since the 1950s, it has been regarded as a separate language. Morphologically, the language most resembles Chukchi. In terms of structure Aliutor is an incorporating or polysynthetic language. There are three dialects: Ukin, Karaga and Palana, but neither the dialectal division nor the individual dialects have been sufficiently studied. According to P. Skorik, the Karaga and Palana dialects could be classified as cognate languages of Aliutor. As with the Chukchi language, there are regular pronunciation differences in men’s and women’s usages. Women say ts where men have l or s (e.g. plaku versus ptsaku ‘footwear’). Men’s usage is considered improper for women and vice versa. Through close contacts with their kindred peoples the Aliutors are able to use their mother tongue to communicate with the Koryak and the Chukchi. The role of Russian has grown since the 1930s and since the 1960s the Aliutors have voluntarily started to change over to the Russian language as this schooling helps them gain work in a Russian environment. There is no written language. Instead, the Aliutors, who were then considered just a dialect group of the Koryak, used the Koryak written language introduced in 1923. A few articles in the so-called Aliutor dialect were published in a local newspaper. Since 1958, Aliutor has been considered a separate language (P. Skorik), but this has not meant a higher prestige, more attention or more active research. Communication with neighbouring peoples is still in either Koryak or Russian. Russian is also the sole language of education and cultural activities. All research on the Aliutor people dates from recent times. The first notes on their language were made by S. Stebnitski in 1927. He was also the author of the first survey of the phonetics, morphology and syntax of the language (1934, 1938), but, as everybody else he considered it a Koryak dialect. Any attention hitherto paid to the Aliutor language and its dialectal divisions can hardly be considered sufficient. A survey by I. Vdovin (1956) and a study of the Karaga dialect from the point of view of experimental phonetics made by G. Melnikov (1940) are unpublished. The longest publication available is a chapter dedicated to the Aliutor language by A. Zhukova, published in Vol. 5 of The Languages of the Peoples of the USSR (1968). The Aliutors have long been considered as part of the Koryak people. Yet the Aliutor reindeer-breeders ramkyken could be distinguished from Chavchus as the Chavchus’ main activities were fishing, and seal hunting, and their herds were not large. So the language and life-style of the ramkyken were more resemblant of those of the settled Aliutors for whom fishing and the hunting of sea animals was the main livelihood. By the end of the 18th century the resistance of the Kamchatka peoples was broken by Russians. The territories of the Aliutors were also conquered. In the 19th century Russian Orthodox missionaries were followed by Russian merchants. As well as being swindle by the merchants — often pulled off with the help of vodka and promissory lists — the Aliutor people were subjected to the whims and compulsions of Russian bureaucracy. Major changes were brought about by the establishment of Soviet power in 1923. In 1930, the Koryak National District was formed. Along with the introduction of collectivization the reindeer-breeders were forced to settle down. This had a far-reaching effect on a large part of the Aliutors as well. Their whole life-style changed. New economic relations were woven accompanied by ideological reorientation and the abolishing of illiteracy. Initially, the Aliutors learned the Koryak script, but the use of written Russian gradually came to dominate. A ‘militant atheism’ was propagated to counter shamanism and religion. Russian homes and machines, their education system and traditions in clothing and diet were held up as examples of progress. Nowadays all of these things are constituents of the normal way of life. The use of the Aliutor language and the observance of local customs are derided by Russians who consider such conduct primitive. The fate of the Aliutors is a sad example of the accumulation of negative phenomena in accompaniment with the advance of civilization. The political and industrial innovations have become a danger not only to the survival of the Aliutors’ own culture but also to their whole physical existence. The present self-designation aleut was first suggested by the Russians who reached the Aleutian Islands in 1741 during an expedition led by V. Bering. Written sources have used the name since 1747 and gradually it has been adopted by the Aleuts. Final consolidation of the name took place in the first decades of this century. According to G. Menovshchikov the name is derived from an Aleut word allíthuh meaning ‘community; host’. The old self-designation unangan evidently applied to the eastern Aleuts only, meaning probably ‘coastal people’ (K. Bergsland). Local groupings and inhabitants of different islands are known to have also used other names for themselves. The Aleut people are the native inhabitants of the Aleutian Islands, the southwestern part of the Alaskan peninsula and the off-shore islands of Shumagin. Since the beginning of the 19th century there have been resettled Aleuts living on Commander Islands (Bering and Mednyi) which are under Soviet jurisdiction. The Aleut District in the Kamchatka Region was established in 1932. In 1969 the Aleuts of those two islands were gathered to live in Nikolskoye, Bering Island. In the middle of the 18th century, when Russians first explored the place, the islands were nearly all inhabited. The number of the Aleuts was estimated at approximately 25,000. Mass murder and enslavement of the natives reduced their numbers drastically. According to the data supplied by the missionary I. Veniaminov in 1834 there were less than 2,500 Aleuts left. The 1918 epidemics of smallpox and grippe took a further toll. In 1945 the anthropologist A. Hrolicka estimated the number of Aleuts at about 1,400. Nowadays the world number of the Aleuts is believed to be about 6,000. Part of the Eskimos of southeastern and southern Alaska also consider themselves Aleut. In the 1970s there were about 500 Aleuts living on the Commander Islands, but by 1984 their number had dropped to 300. On the US part of the Aleutian Islands a census was carried out in 1960 according to whose data there were 2,100 Aleut (mostly half-bred) who made up 35 % of the local population. Anthropologically Aleuts are close to the Eskimo people belonging to the mongoloid Arctic race. Their mingling with other types often emphasized in academic literature is evidently not well grounded. Newer results prove that despite the historical heterogeneity of the Commander Aleuts their genetic structure is Aleut. The Aleut people were believed to have first arrived on the Aleutian Islands from the coast of northeastern Asia or from Alaska, not earlier than 3,000 years ago. Latest research suggests that the aleuts arrival must have happened considerably earlier. Now the settlement of the Aleutians is associated with the time when there was still a land connection between America and Asia, that is, no later than 10–12 thousand years ago. The Aleut language, belonging to the Eskimo-Aleut languages, is considered as a member of the Paleo-Asiatic group. According to incomplete data the Aleut language can be divided into three dialects: Attu (Western), Atka and Unalaska (Eastern). The differences are small and do not impede mutual intelligibility. The present-day Aleuts are bilingual. The American Aleuts speak English, while the Asiatic Aleuts had already been russified by the beginning of the 19th century. According to G. Menovshchikov the Aleuts of Bering Island speak the Atka dialect with a well-preserved basic vocabulary and grammatical structure. The version previously used on the Mednyi (Copper) Island was of the Attu dialect. In addition the strong Russian influence has produced a strange pidgin where verbs are conjugated by means of Russian suffixes, etc. Menovshchikov has suggested that the pidgin which is still spoken to a certain extent on Mednyi Island was at one time a lingua franca for Russians and the Aleut people. Although the Aleut language has relatively much in common with Eskimo languages, the grammatical and lexical differences are considerable. The glotto-chronological method dates the linguistic divergence of the Aleut and the Eskimo peoples as at least 1000–2000 years back. Common developments can be traced in the phonology and word structure, but there are very few common roots in the lexis of the two languages. It is believed that the phonology of Aleut is more ancient than the Eskimo language. The linguistic and cultural influence of Russian started to make itself felt by the 18th century. By the beginning of the 19th century practically all Aleuts living on Russian territories had been converted to Russian Orthodoxy. This was an efficient means of checking the local culture and language. On Bering Island the Russian influence has not penetrated to grammar yet, but some of it has been noticed in the vocabulary. The inhabitants of Mednyi Island are very much isolated from the remaining Aleut area. Nowadays their ordinary means of communication is Russian. Aleut has been preserved fragmentarily by the older members of but a few families but in general Aleut has receded before Russian. Another strong wave of Russian swept over the islands during the Soviet period. Many Aleuts have left their native islands in search of better education. Ethnically pure marriages are rare, in most cases the spouse is found among another nation. According to R. Lyapunova the number of Aleuts living at Nikolskoye, Bering Island is about 300. About 200 live elsewhere, mostly on the Kamchatka peninsula. The same author points out that outside their own native islands the half-bred Aleuts refrain from calling themselves Aleut, but returning home they resume their ethnic identity. The Aleut people have always derived their livelihood from the hunting of sea mammals (seals, fur-seals, etc.) and fishing. In the severe polar conditions the gathering of everything edible was also of great importance. Hunting and fishing gear was made of stone, bone and wood. Family relations were characterized by polygamy (both ways), giving away children to uncles to foster, and the mutual exchange of children. According to traditional practice the catch and game belonged to the whole community, not to the hunter and his family only. The dwellings were half-earthen and large. Male as well as female clothing was made of animal and bird skins. Mats and baskets woven of grass were popular in every household. Traditional food consisted of the meat of sea mammals and seabirds, fish (eaten raw) and molluscs. The sources of Russian cultural influence were the Russian administration, the Russian Orthodox Church and the parochial school. Folk art (pantomime dances, for example) still survived, but were practised in jealously guarded secrecy for fear of Russian disparagement. Nowadays mink-farming and cattle-breeding as well as horticulture have developed in addition to the traditional branches of economy. Those Aleuts who were forcefully resettled to the Commander Islands had to accommodate their life-style to the local natural conditions. There the winters are colder and there is more snow than on the Aleutian Islands. The inhabited northern part of Bering is just flat tundra, and Mednyi is rocky. New means of transport — the dog harness (also in summer) were introduced. Nowadays folk culture survives to a certain extent thanks to the Museum of Local Lore, Children’s Art School and a folklore ensemble. The Aleut people became an object of research following the Russian occupation. The initiative belonged to the missionary I. Veniaminov. Nowadays extensive research projects are under way in the USA. An Aleut writing system with its base the Cyrillic alphabet, was devised in the 19th century by I. Veniaminov and V. Metsvetov. As on Bering Island there was a parochial school (belonging to the Russian-American company), and nearly all adult men could read and write in Russian. In addition there was always a native Aleut around teaching children the same skills in the Aleut language. In 1867 when the Aleutian Islands were ceded to the USA the writing system fell into disuse. The teaching of the Aleut language to the US Aleuts was resumed in the middle of the 1970s only. It seems that the situation it is very bad for them after the Russian occupation. It may be difficult to reach them during the travel, as they are perhaps hard to locate and contact. By the way, I should start thinking on updating my route map! In the cliché-ridden propaganda of the Soviet era tsarist Russia was frequently dubbed the “prison of nations”. When the Soviets came into power this “prison”, by virtue of new national policies, transformed into a family of friendly and brotherly nations in whose bosom all the national cultures flourished. To boast of the achievements under the Communist Party leadership, grandiose cultural festivals were arranged in the Soviet republics, folkloristic dance, song and instrumental groups were established and the revival of old peasant culture was encouraged. The slogan “socialist in content, nationalist in form” came to be applied to the new Soviet culture. Behind this deceptive facade of ethnographic originality, the tsarist prison of nations never ceased to exist: russification was carried out on a large scale, nationalist intellectuals were persecuted, a policy of extensive exploitation of land was pursued and nations were continuously resettled and mingled. The desired result was the birth of a new, Russian-speaking “Soviet nation”, and to lay the theoretical foundation for this a whole army of scholars was employed. The evolution of the Soviet nation was seen as the process of history within the cognizance of Marxist-Leninist principles which was as inevitable as the process of life itself. The recent rapid collapse of the Soviet economic and political system has revealed the consequences of these brutal colonization policies: hundreds of culturally and economically crippled nations, with the smallest of them nearing the crucial point of extinction. The authors of the present book, who come from a country (Estonia) which has shared the fate of nations in the Russian and Soviet empires, endeavour to publicize the plight of the small nations whose very existence is threatened as a result of recent history. Perhaps it is not too late to give a supporting hand to them without an attempt at either ideological brainwashing or economic exploitation. PALEO-ASIATIC PEOPLES: Aleuts, Aliutors, Asiatic Eskimos, Chukchis, Itelmens, Kereks, Kets, Koryaks, Nivkhs, Yukaghirs. MANCHU-TUNGUS PEOPLES: Evens, Evenks, Nanais, Negidals, Orochis, Oroks, Udeghes, Ulchis. URALIC PEOPLES: Enets, Ingrians, Izhorians, Karelians, Khants, Kola Lapps, Livonians, Mansis, Nenets, Nganasans, Selkups, Veps, Votes. It seems that my work it has been multiplied now! But I see they use the language as a criteria to stablish the boundaries of a tribe, so I have not been wrong until the date. They offer also a selected bibliography of the different tribes for further research. I found this article in The Independent newspaper. I do like travel writing, and I recently read some books about Siberia. This one, by Shaun Walker, it is quite interesting too. What a wonderful job, to be a travel writer! Think our winter’s been a bit grim? Try visiting Yakutsk – the Russian city where ‘a bit nippy’ means minus 50C, and a quick dash to the corner shop could end in frostbite. Shaun Walker enjoys amini-break in deepest Siberia. At minus 5C, the cold is quite refreshing and a light hat and scarf are all that’s required to keep warm. At minus 20C, the moisture in your nostrils freezes, and the cold air starts making it difficult not to cough. At minus 35C, the air will cold enough to numb exposed skin quickly, making frostbite a constant hazard. And at minus 45C, even wearing glasses gets tricky: the metal sticks to your cheeks and will tear off chunks of flesh when you decide to remove them. I know this because I’ve just arrived in Yakutsk, a place where friendly locals warn you against wearing spectacles outdoors. Yakutsk is a remote city in Eastern Siberia (population 200,000) famous for two things: appearing in the classic board game Risk, and the fact that it can, convincingly, claim to be the coldest city on earth. In January, the most freezing month, average “highs” are around minus 40C; today the temperature is hovering around minus 43C, leaving the city engulfed in an oppressive blanket of freezing fog that restricts visibility to 10 metres. Fur-clad locals scurry through a central square adorned with an icy Christmas tree (left over from the New Year holidays) and a statue of a strident Lenin, with one arm aloft and pointing forward, thoroughly unfazed by the cold. A couple of weeks ago, Yakutsk hit the headlines after a series of burst pipes caused Artyk and Markha, two nearby villages, to lose their heating for several days. The temperatures then were minus 50C. Television footage of the ensuing “big freeze” showed groups of people huddled in swathes of blankets gathering round makeshift wood-fired stoves to keep warm. It looked like fun – of a sort. So I decided to come to Yakutsk for myself to find out how people manage to survive, and go about something resembling daily life, in the world’s coldest place. Ainu: [ain] South Sakhalin Island and southern Kuril Islands. Dialects: Sakhalin (Saghilin), Taraika, Hokkaido (Ezo, Yezo), Kuril (Shikotan). Classification: Language Isolate Nearly extinct. Aleut, Mednyj: [mud] 10 (1995 M. Krauss). Copper Island, Komandor Islands. Alternate names: Medny, Copper, Copper Island Aleut, Attuan, Copper Island Attuan, Creolized Attuan. Classification: Mixed Language, Russian-Aleut Nearly extinct. Enets, Forest: [enf] 40 (1995 M. Krauss). Ethnic population: 209 with Tundra Enets (1989 census). Taimyr National Okrug. Along the Yenisei River’s lower course, upstream from Dudinka. The Forest variety is in the Potapovo settlement of the Dudinka Region. Alternate names: Yenisei Samoyedic, Bay Enets, Pe-Bae. Dialects: Forest and Tundra Enets are barely intelligible to each other’s speakers. It is transitional between Yura and Nganasan. For a time it was officially considered part of Nenets. Classification: Uralic, Samoyed Nearly extinct. Enets, Tundra: [enh] 30 (1995 M. Krauss). Ethnic population: 209 together with Forest Enets (1990 census). Taimyr National Okrug. Along the Yenisei River’s lower course, upstream from Dudinka. ‘Tundra’ in the Vorontzovo settlement of the Ust-Yenisei Region. Alternate names: Yenisei Samoyedic, Madu, Somatu. Dialects: Tundra and Forest Enets barely intelligible to each other’s speakers. It is transitional between Yura and Nganasan. For a time it was officially considered part of Nenets. Classification: Uralic, Samoyed Nearly extinct. Karagas: [kim] 25 to 30 (2001). Ethnic population: 730 (1989 census). Siberia, Irkutsk Region. Alternate names: Tofa, Tofalar, Sayan Samoyed, Kamas, Karagass. Classification: Altaic, Turkic, Northern Nearly extinct. Kerek: [krk] 2 (1997 M. Krauss). There were 200 to 400 speakers in 1900. Ethnic population: 400. Cape Navarin, in Chukot villages. Dialects: Mainypilgino (Majna-Pil’ginskij), Khatyrka (Xatyrskij). Previously considered a dialect of Chukot. Classification: Chukotko-Kamchatkan, Northern, Koryak-Alyutor Nearly extinct. Orok: [oaa] 30 to 82 in Russia (1995 M. Krauss). Population total all countries: 33 to 85. Ethnic population: 250 to 300 (1995 M. Krauss). Sakhalin Island, Poronajsk District, Poronajsk town, Gastello and Vakhrushev settlements; Nogliki District, Val village, Nogliki settlement. Also spoken in Japan. Alternate names: Oroc, Ulta, Ujlta, Uilta. Dialects: Poronaisk (Southern Orok), Val-Nogliki (Nogliki-Val, Northern Orok). Significant differences between dialects. For a while Orok was officially considered part of Nanai. Classification: Altaic, Tungus, Southern, Southeast, Nanaj Nearly extinct. Yugh: [yuu] 2 or 3 (1991 G. K. Verner in Kibrik). Nonfluent speakers. Ethnic population: 10 to 15 (1991 G. K. Verner in Kibrik). Turukhan Region of the Krasnoyarsk Krai at the Vorogovo settlement. Previously they lived along the Yenisei River from Yeniseisk to the mouth of the Dupches. Alternate names: Yug. Classification: Yeniseian Nearly extinct. Yukaghir, Northern: [ykg] 30 to 150 (1995 M. Krauss, 1989 census). Ethnic population: 230 to 1,100 (1995 M. Krauss, 1989 census). Yakutia and the Kamchatka Peninsula. Alternate names: Yukagir, Jukagir, Odul, Tundra, Tundre, Northern Yukagir. Dialects: Distinct from Southern Yukaghir (Kolyma). It may be distantly related to Altaic or Uralic. Classification: Yukaghir Nearly extinct. Yukaghir, Southern: [yux] 10 to 50 (1995 M. Krauss, 1989 census). Ethnic population: 130 (1995 M. Krauss, 1989 census). Yakutia and the Kamchatka Peninsula. Alternate names: Yukagir, Jukagir, Odul, Kolyma, Kolym, Southern Yukagir. Dialects: Not inherently intelligible with Northern Yukaghir. Classification: Yukaghir Nearly extinct. Yupik, Naukan: [ynk] 75 (1990 L.D. Kaplan). Ethnic population: 350. Chukota Region, Laurence, Lorino, and Whalen villages, scattered. Formerly spoken in Naukan village and the region surrounding East Cape, Chukot Peninsula, but they have been relocated. Alternate names: Naukan, Naukanski. Dialects: 60% to 70% intelligibility of Chaplino. Classification: Eskimo-Aleut, Eskimo, Yupik, Siberian. The Koryaks are the main population of the northern Kamchatka part. They have their own autonomy – the Koryaksky Region. The name of this people as Krasheninnikov and Steller thought originated from “khora” – “deer”. But Kryaks don’t call themselves with this word. The coastal residents call themselves as “nimilany” – “residents of a settled village”. Nomads herding deer called themselves “chavchuvens“, it means “reindeer people”. For the Chavchuvens reindeer breading was the main, even the only way of living. Deer gave them everything necessary: meat, skin for clothes (reindeer skin for coveralls, footwear) and for building of thansportable dwellings (yarangas), bones were used for making tools and household articles, fat – for dwelling lightening. Deer were a means of conveyance either. For the Nimilans the main way to survive was fishing. Fish was generally caught in rivers with the help of stinging-nettle (it took about two years to make one net and it was used only for one year). In settled villages marine hunting was the second way of surviving after fishing. Going out to sea on skin covered baydarkas was common. Harbor seal and whales became the target of harpoons, which were tied to the bow, and were killed with stone tip spears. Marine animals, skin was used for boat, ski covering, footwear, bags, sacks and belts. Domestic activities were highly developed – wood and bone carving, metal works, national clothes and carpets making, embroiling with beads, braiding. A lot of such works are displayed at the Museum of Local Lore. Tourists can admire the skillfulness of the masters. The Nimilans lived in groups: in winter – in half-dug-houses, in summer – in booths with their families, they used to catch fish, to hunt, and to pick berries. The Chavchuvens lived in temporary settlements consisting of some skin-covered yarangs. They used to herd reindeer and to dress skin. Hunting and fishing were of the secondary value for them. They migrated on dog- and reindeer-sledges. The name of the nationality means “living here”. The south bound of settling is the Lopatka Cape. Northern one – the Tigil River on the west coast, the Uka River is on the east coast. Ancient Itlmen settlements were located on the banks of the Kamchatka (Uykoal), Yelovka (Kooch), Bolshaya, Bistraya, Avacha rivers and on the Avacha Harbor coast. At the end of the 17 – beginning of the 18 centuries, when Russian explorers crossed the central part of Kamchatka, the Itelmens were at the level of disintegration primitive communal system development. At the settlement consisting of a few half-dug-houses the folk Toyony lived. Some names of Toytony are written on the of Kamchatka. Itelmens life in summer was spent near some water resources and on them. They moved along the rivers in whole-carved boats made mainly of poplar. They caught fish with threshed nettle nets, built trapping dams. Some fish was cooked as yukola, some was burried for some time under the ground. But lack of salt didn’t allow to store much fish. Hunting was of the same value for this folk – fox, sable, bear, snow sheep; at the coast area – marine animals: sea lion, seal, sea otter. Also gathering was very popular (edible roots, edible and officinal plants, berries). Means of conveyance were made of birch (sledge and cargo sledge with soft belts). The ancient sledges were richly decorated. The Itelmens ate a lot of fish, preferred baked one (chuprikh) and fish cakes “telno”, they ate young sprouts and runners of Filepinolium Maxim, Heracleum Dulse Fish (processed and ate them only after they acquired stinging power); as a medicine against scurvy they used cedar cones with dry salmon caviar chasing this mixture with tea. Food was seasoned with fat – favorite spice of all northern peoples. Women-Itelmens had a custom to wear wigs. Those who had the most luxurious and the thickest one was highly honored. Those fashionable women never wore hats. Young women did up their heavy black raven-wing-like hair in lot of thin plaits decorating them with small hair wigs in the shape of hats. Perhaps, that’s why the Chukchis and Koryaks might have called the Itelmens kamchadals, because in both languages the word “kamcha” means “curly”, “disheveled”, and “levit” or “lyavit” means “head”. Itelmens clothes were extraordinary, they were made of sable, fox, snow sheep, dog’s skin with numerous ermine tassels and fluffy edged sleeves, hood, collar and hem. Steller wrote: “:the most beautiful reindeer skin coveralls (kukhlyankas) were decorated on the collars, sleeves and hems with dog’s fur, and on the kaftan (short reindeer skin coverall) was hanged with hundreds of seal’s tassels coloured red, they dangled to and fro at every movement”. Such Itelmens’ clothing made an impression of hairiness. The Evens and Evenky (tunguses) are similar by culture. The Evens ancestors having come to Kamchatka changed their traditional occupation hunting for reindeer breeding. Russians arriving to Kamchatka called the Evens roaming from place to place along the Okhotsk seaside “lamuts”, it means “living by the sea”. Herdsmen they called “orochi”, it means “reindeer men”. Beside reindeer breeding and hunting the coastal Evens caught fish and hunted marine animals. For fishing they made different kinds of dams and traps. Blacksmith’s work was very popular with the Evens. The Evens did not wear blind clothes like the Koryaks, Itelmens and Chukcis did, but unlacing ones. Complete set of a man’s wear consisted of a short knee-reaching reindeer parka with running down lapels, trousers, a chest apron put on the parka, knee protectors, furstockings and boots made of reindeer led skin with soles of bearded seal skin. Wearing especially women’s one was decorated with beads. In contrast to other natives of Kamchatka the Evens didn’t use dogsleds and didn’t wear blind clothes. The Northern Koryaks’ neighbours were the Chukchis, “reindeer men” (chauchu), some of them moved to Kamchatka. As for the household the Chukchi were like the Koryaks – reindeer breeders. A holder of less than 100 reindeer was considered poor and couldn’t keep a herd. Unfortunately, history of these two peoples’ neighbourhood knows a lot of examples of wars for herds. The Chukchis are native Kamchatka people, now a lot of them live here. Like the Koryaks there were the Chukchis who lived in settled villages and provided their living by fishing and hunting for marine animals. The Chukchis are perfect seamen skillfully operating boats on a cold sea. It is well known that their “fleet” used to trade with the Eskimoes launching towards the American shore. Main hunting implements were a bow and arrows, a spear and a harpoon. A bow and a spear were used in hunting for wild reindeer and snow sheep, a harpoon and a lance – in marine hunting. Arrow-, spear- and harpoon-heads were made of bone and stone. In catching all water-fowl and game the Chukchis used bola (an instrument for catching birds on the wing) and pratsha (a military weapon either). The protection armour was made of antlers, walrus’ skin and tusks. Main Chukchis‘ means of conveyance was reindeer, but like the Koryaks and Itelmens they also used dogsledges. On the sea the Chukchis moved in kayaks accommodating 20-30 men. With favorable wind they used square sails made of reindeer suede (rovdugas) like the Koryaks–Nimilans, and for a better balance they tied to board sides stocking-like sealskin, which was filled with air. The Aleuts – ancient Aleutian Islands natives. They called themselves “unangan”, it means “seaside residents”. Main traditional Aleuts‘ occupations were hunting for marine animals and fishing. For winter the Aleuts stored eggs from birds colonies on the seashore. The dwellings of the Aleuts were similar to the traditional half-dughouses but slightly different. Among the household articles there were baskets, bags plaited from grass; for storing of fat, yukola, crowberries with fat and so on dry seal stomach was used. On the Bering Island dogsleds became a very popular means of conveyance. For wandering in the mountains the Aleuts of the Medny Island used broad skis covered with seal skin for the nap would help while climbing not to slide down from the mountain. 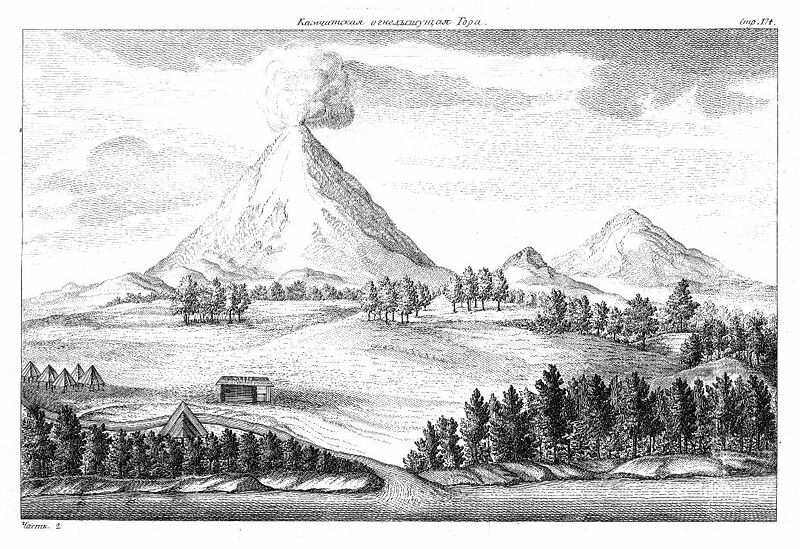 Illustration from Stepan Krasheninnikov’s Account of the Land of Kamchatka (1755). The Kamchatka Peninsula (Russian: полуо́стров Камча́тка) is a 1,250-kilometer long peninsula in the Russian Far East, with an area of 472,300 km². It lies between the Pacific Ocean to the east and the Sea of Okhotsk to the west. Immediately offshore along the Pacific coast of the peninsula runs the 10,500 meter deep Kuril-Kamchatka Trench. […] Muscovite Russia claimed the Kamchatka Peninsula in the 17th century. Ivan Kamchaty, Simon Dezhnev, the Cossack Ivan Rubets and other Russian explorers made exploratory trips to the area during the reign of Tsar Alexis, and returned with tales of a land of fire, rich with fish and fur. In 1697, Vladimir Atlasov, founder of the Anadyr settlement, led a group of 65 Cossacks and 60 Yukaghir natives to investigate the peninsula. He built two forts along the Kamchatka River which became trading posts for Russian fur trappers. From 1704 to 1706, they settled the Cossack colonies of Verkhne- (upper) and Nizhne- (lower) Kamchatsky. Far away from the eye of their masters, the Cossacks mercilessly ruled the indigenous Kamchadal. Excesses were such that the North West Administration in Yakutsk sent Atlasov with the authority (and the cannons) to restore government order, but it was too late. The local Cossacks had too much power in their own hands and in 1711 Atlasov was killed. From this time on, Kamchatka became a self-regulating region, with minimal interference from Yakutsk. By 1713, there were approximately five hundred Cossacks living in the area. Uprisings were common, the largest being in 1731 when the settlement of Nizhnekamchatsky was razed and its inhabitants massacred. The remaining Cossacks regrouped and, reinforced with firearms and cannons, were able to put down the rebellion. The Second Kamchatka Expedition by the Danish explorer Vitus Bering, in the employ of the Russian Navy, began the “opening” of Kamchatka in earnest, helped by the fact that the government began to use the area as a place of exile. In 1755, Stepan Krasheninnikov published the first detailed description of the peninsula, An Account of the Land of Kamchatka. The Russian government encouraged the commercial activities of the Russian-American Company by granting land to newcomers on the peninsula. By 1812, the indigenous population had fallen to fewer than 3,200, while the Russian population had risen to 2,500. In 1854, the French and British, who were battling Russian forces on the Crimean Peninsula, attacked Petropavlovsk-Kamchatsky. During the Siege of Petropavlovsk, 988 men with a mere 68 guns managed successfully to defend the outpost against 6 ships with 206 guns and 2,540 French and British soldiers. Despite the heroic defense, Petropavlovsk was abandoned as a strategic liability after the Anglo-French forces withdrew. The next year when a second enemy force came to attack the port, they found it deserted. Frustrated, the ships bombarded the city and withdrew. The next fifty years were lean ones for Kamchatka. The military naval port was moved to Ust-Amur and in 1867 Alaska was sold to the United States, making Petropavlovsk obsolete as a transit point for traders and explorers on their way to the American territories. In 1860, Primorsky (Maritime) Region was established and Kamchatka was placed under its jurisdiction. In 1875, the Kuril Islands were ceded to Japan in return for Russian sovereignty over Sakhalin. The Russian population of Kamchatka stayed around 2,500 until the turn of the century, while the native population increased to 5,000. World War II hardly affected Kamchatka except for its service as a launch site for the invasion of the Kurils in late 1945. After the war, Kamchatka was declared a military zone. Kamchatka remained closed to Russians until 1989 and to foreigners until 1990. I continue with the posts that place the Arctic circle cultures in the map thanks to Ethnologue website. The two previous ones were about Alaska and Canada on the one hand and Kalaallit Nunaat (Greenland) on the other. will include the Kola peninsula and the territories that border it to have all the Saami languages toghether. I think this will help understanding the family languages. Republic of Finland, Suomen Tasavalta. 5,214,512. National or official languages: Finnish, Swedish. Literacy rate: 100%. Also includes English (4,500), Northern Kurdish (1,293), Polish, Romanian (1,000), Russian (10,000), Somali (3,103), Spanish, Standard German, Tatar (1,000), Turkish (1,000), Vietnamese, Arabic, Chinese. Information mainly from M. Stephens 1976; B. Comrie 1987; T. Salminen 1987–1998. Blind population: 3,345. Deaf population: 8,000 to 307,333 (1986 Gallaudet University). Deaf institutions: 44. The number of languages listed for Finland is 13. Of those, 12 are living languages and 1 is extinct. Kingdom of Norway, Kongeriket Norge. 4,574,560. National or official language: Norwegian. Literacy rate: 96% to 100%. Also includes Danish (12,000), English, Finnish (5,358), Northern Kurdish (3,000), Russian (3,000), Spanish (6,500), Swedish (21,000), Tibetan, Urdu, Vietnamese (99,000), Chinese (3,000), from Africa (7,000), from Pakistan (17,000). Information mainly from M. Stephens 1976; B. Comrie 1987; I. Hancock 1991; J. Hupli 1998; B. Winsa 1998. Blind population: 4,000 (1982 WCE). Deaf population: 4,000 to 261,618 (1998). Deaf institutions: 12. The number of languages listed for Norway is 11. Of those, all are living languages. [sje] Between Saltenfjord and Ranenfjord in Norway. Alternate names: “Lapp”, Pite. Classification: Uralic, Sami, Western, Northern Nearly extinct. [sia] 8 (2000 T. Salminen). Ethnic population: 100 (1995 M. Krauss). Southwest Kola Peninsula. Alternate names: Ahkkil, Babinsk, Babino. Dialects: Closest to Skolt. Classification: Uralic, Sami, Eastern Nearly extinct. [sjt] 6 (1995 M. Krauss). Ethnic population: 400 population (2000 Salminen). Alternate names: “Ter Lappish”, “Lapp”, Saam. Classification: Uralic, Sami, Eastern Nearly extinct. Kingdom of Sweden, Konungariket Sverige. 8,986,400. National or official language: Swedish. Literacy rate: 99%. Also includes Amharic, Assyrian Neo-Aramaic, Chaldean Neo-Aramaic, Danish (35,000), Estonian (1,560), Greek (50,000), Kirmanjki, Latvian (450), Lithuanian (310), Northern Kurdish (10,000), Serbian (120,000), Somali, Spanish (35,000), Tosk Albanian (4,000), Turkish (20,000), Turoyo (20,000), Western Farsi (35,000), Chinese, people from Iraq (6,000), Eritrea, North Africa. Information mainly from B. Comrie 1987; I. Hancock 1991; E. Haugen 1992; O. Dahl 1996; B. Winsa 1998. Blind population: 15,716. Deaf population: 8,000 to 532,210 (1998). Deaf institutions: 72. The number of languages listed for Sweden is 15. Of those, all are living languages. [sje] 20 in Sweden (2000 T. Salminen). Ethnic population: 2,000 in Sweden (1995 M. Krauss). Lapland along Pite River in Arjeplog and Arvidsjaur. Also spoken in Norway. Alternate names: Saami, “Lapp”, Pite. Classification: Uralic, Sami, Western, Northern Nearly extinct. [sju] 20 (2000 T. Salminen). Ethnic population: 1,000 (1995 M. Krauss). Lycksele, Mala, Tärna, and Sorsele, along the Ume River. Probably no speakers in Norway. Alternate names: “Lapp”, Saami, Ume. Classification: Uralic, Sami, Southern Nearly extinct. As you see, this classification is quite confusing, as the Saami languages are repeated in many countries. This is because the political borders, that cut the Saami lands. I will redo the classification in the future having as a starting point Sápmi and not those countries. The NWO project “Voices from Tundra and Taiga” started in May 2002 and lasted until June 2005. In a number of subprojects, carried out by different teams throughout the Russian Federation, this project contributed to the strengthening and revitalization of various minor indigenous languages of the Russian North, including Nenets, Nivkh, Yukagir, Khanty, Mansi and others. The project was part of a general research program with the same name. The topic of the research program “Voices from Tundra and Taiga” is the study of endangered languages and cultures of the Russian Federation, which must be described rapidly before they become extinct. This research is in the fortunate position that our earlier work on the reconstruction technology for old sound recordings found in archives in St. Petersburg has made it possible to compare languages still spoken in the proposed research area to the same languages as they were spoken more than half a century ago. These sound recordings consist of spoken language, folksongs, fairy tales etc., among others in Siberian languages. In the NWO project we applied the developed techniques to some of the disappearing minority languages and cultures of Russia: Nivkh and Orok on Sakhalin and Yukagir and Tungus languages in Yakutia. Our aim is to set up a phono- and video-library of recorded stories, and of the folklore, singing and oral traditions of the peoples of Sakhalin and Yakutia. For this purpose the existing sound recordings in the archives of Sakhalin and Yakutia are used together with the results of new fieldwork expeditions. The data are added to the existing archive material in St. Petersburg and part of is made available on the Internet and/or CD-ROM. Spontaneous speech and prepared texts are collected that are valuable for (ethno)linguistic as well as for anthropological, folkloric and ethno-musicological analysis. For that purpose, the data are (video)recorded and analysed as to the art of story telling and language use. Described texts are published in scientific journals and books with audiovisual illustrations on CD-ROM and on the Internet. The materials thus become available for further analysis to researchers working in the field of phonetics, linguistics, anthropology, history, ethno-musicology and folklore. This information is also important for the development of teaching methods for representatives of the related ethnic groups and for the conservation of their language and culture. For this purpose the new centres are equiped with computers, software, sound recorders, literature, etc. The research and documentation is carried out in close co-operation with local scholars. In Yuzhno-Sakhalinsk and Yakutsk local scholars and their assistants participate in the archiving of the sound recordings and in fieldwork expeditions. They are trained at St. Petersburg State University and specialists from St. Petersburg State University also visit them in order to set up new centres for the study and teaching of local languages and related subjects. In July 2005, Tjeerd de Graaf presented the final report of the NWO project carried out together with Russian colleagues in the framework of theVoices from Tundra and Taiga research program.The research group received positive reactions, both from scientists as well as from teachers, students, native speakers and local authorities. This applied in particular to Buryatia, one of Russia’s federal republics in Siberia, where Tjeerd de Graaf and his Buryat colleague Ljubov Radnajeva visited several centres in June and July 2005. During special teacher seminars, they reported on the results of their projects and on the use of information technology in language teaching. Scientists and teachers from Buryatia are ready and eager to take an active part in the realization of similar new projects. A proposal for such a project has been prepared and submitted to the INTAS Organisation of the European Union. According to the latest UNESCO data, the Buryat language is considered an endangered language and is registered in the UNESCO Red Book of Endangered Languages. Meanwhile, many Buryat people demonstrate their wish that their children use the native language. Modern educational resources (such as computer-assisted language learning, multimedia teaching material) are almost non-existent in teaching the Buryat language. It should be mentioned that good and promising conditions exist to develop such teaching resources based on information technology. The proposed joint research project will make this possible. If you have more snowballs for me (aka information, links and resources…) do not hesitate to drop me a line! I started a series of posts linking the information offered by Survival International. This week, I am continuing with Siberia tribes. When I was a child, I heard of Siberia because it was an inhospitable place where people was deported. Even that, its name attracted me. Last year I found an illustrated journal about it, and it surprised me. I think that despite its harshness it is a place worthy of discovering. Siberia’s 30 different tribal peoples range in number from under 200 (the Oroks) to 34,000 (the Nenet). They live in an area that covers 58% of Russia. How do they live? Some of these peoples are nomadic reindeer herders, living in the tundra (arctic plain); others, who live in the forest tundra or taiga (coniferous forest), rely on a mixture of reindeer herding and hunting and gathering, and often live in settlements. Today 10% of Siberia’s tribal peoples live a nomadic or semi nomadic life, compared to 70% just 30 years ago. The languages the different tribes speak are from a range of linguistic families: some bear no similarity to any other language, and none bear any relation to Russian. Some larger indigenous peoples, the Sakha (formerly called Yakuts) and Komi, have their own republics within the Russian state. What problems do they face? 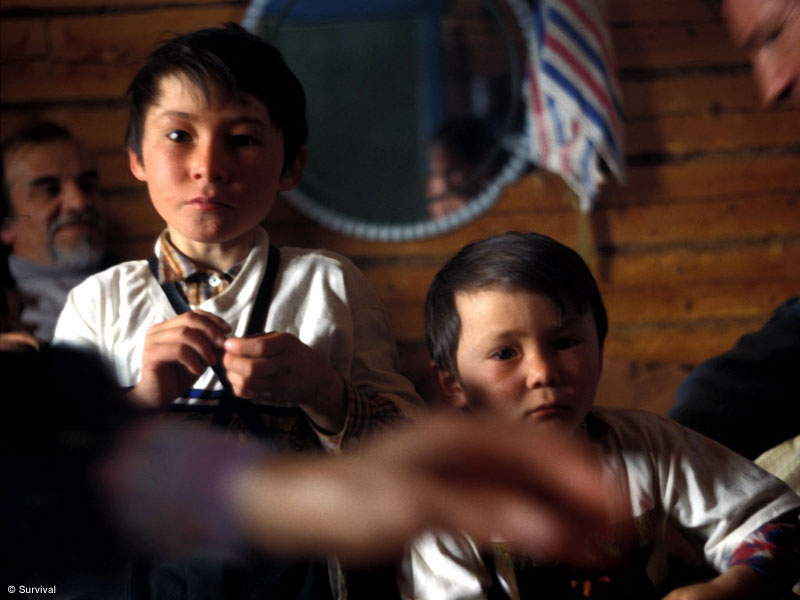 Under the Soviet administration, the tribal peoples lost their land to state-run industries. With industrialisation, their region was taken over by outsiders, and the authorities made strong efforts to suppress indigenous languages, culture and ways of life. Today their biggest problems are the environmental degradation caused by the oil, gas and logging industries in the area, and the lack of clarity about land rights. How does Survival help? Survival supports Russian indigenous organisations such as the Russian Association of Indigenous Peoples of the North (RAIPON), backing their demands that indigenous peoples are consulted about industrial projects and given the right of veto, and given compensation where their land has already been destroyed. We also support the call for Russia to ratify International Labour Organisation Convention 169 on the rights of indigenous and tribal peoples, and specifically for tribal land ownership rights to be recognised. It is been quite surprising for me to find out how minority tribal rights and environment is binded. How in Siberia, Scandinavia or Labrador they are thrown out of its own lands because they are considered mere power sources.